Boasting beautiful bushland, amazing art and architecture, rich local produce and world-class wine, there’s something for everyone in this cultured compact city in northern Tassie, writes Aimee Leabon. 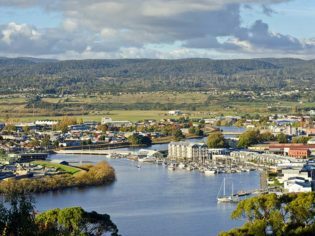 Launceston is in northern Tasmania, where the South and North Esk Rivers meet to become the Tamar River. Settled in 1806, it’s one of the oldest cities in Australia and the second largest in Tasmania (after Hobart). Qantas, Jetstar and Virgin Australia fly direct routes from Sydney, Melbourne, Brisbane and Adelaide. You can drive from Hobart via the B31 and Midland Highway in about two-and-half hours (just under 200km). By sea, take the Spirit of Tasmania ferry (there are daily sailings) from Port Melbourne to Devonport. Then it’s just over an hour’s drive to Launceston (about 100km). Why is Launceston so great? The minute you hit the tarmac, you get a glimpse of the country aspect of ‘Launy’, as it’s affectionately known by the locals. There are sheep fenced off on the edge of the runway (yes, really), rolling hills and leafy green paddocks that stretch for miles. 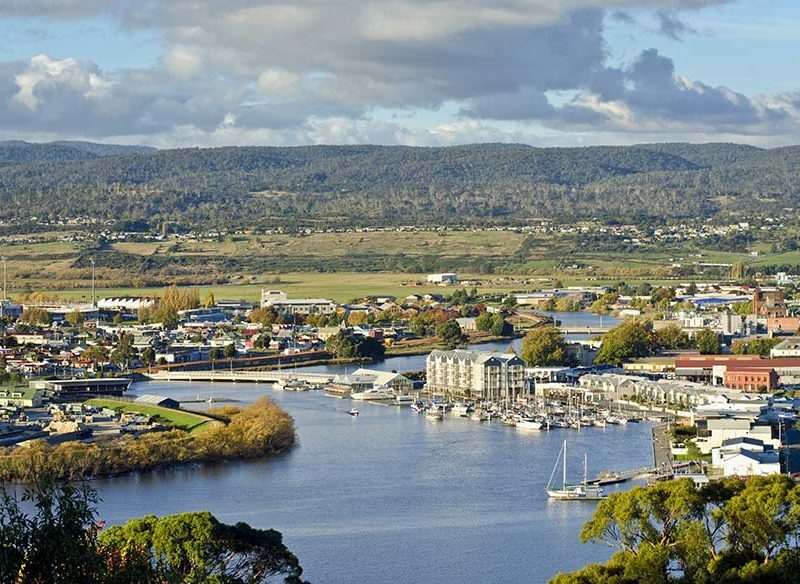 But drive for just 15 minutes and you’ll hit Launceston’s urban centre – cobblestone shopping arcades with hole-in-the-wall cafes, gourmet delis displaying Tassie’s finest food and heritage-listed houses and buildings of diverse architectural genres. It has a small town vibe and a slow pace to match. And then there’s Launceston’s fascinating cultural heritage. It’s a real city of firsts: the first to have domestic electricity in Australia, the first to use anaesthetic in the southern hemisphere and the first to have underground sewers. It’s also the home of Australia’s first espresso machine! Everything is a stone’s throw away, from wilderness walks to cool-climate vineyards and great dining spots that serve up the best home-grown fare. Cataract Gorge Reserve: Lace up your joggers for a jaunt along one of the four walking trails (from 1km to 2.2km) showcasing Victorian Gardens, cliff grounds, the South Esk River, the Alexandra suspension bridge (which wobbles with authenticity when you reach the middle) and spectacular lookouts. There are places to picnic if you want to bring a packed lunch or alternatively, stop by the Gorge Restaurant or the Basin Café for a bite. And if you’re sick of sauntering, catch The Basin Chairlift (the world’s longest single-span chairlift) and take in the views. All this, just a 15-minute walk from the city centre. Launceston Historic Walks: This stroll through Launceston starts at your tour guide’s home. Robyn Jones and her husband Trevor live in the oldest apartment in the city within the 1842 building, which is in almost original condition. Back in the day it served as a counting house for a wholesale grocery business, but now you’ll find a furniture workshop (Trevor handcrafts pieces from Tasmanian timbers such as Huon Pine, Myrtle, Blackwood and Sassafras) and a gallery for local artists to promote their work. Once you’ve explored the warehouse (head up the staircase and marvel at the tiny servants’ quarters), wander through the streets of Launceston for a glimpse of the various architectural styles peppered throughout the city: from ornate Victorian townhouses to elegant Georgian buildings. Hot tip: Start at Cameron Street, it’s the oldest and most picturesque. Design Centre of Tasmania: This place is a lumber lover’s dream. Walk through the entrance: to the left is a shop heaving with modern furniture, wooden homewares (snap up a chic set of Indeco wooden salt and pepper grinders by award-winning designer and Tassie native Patrick Senior), ceramic plates and bowls, and vibrant enamel jewels. To the right is a spacious gallery which houses the Tasmanian Wood Design Collection – a unique exhibition as each piece is constructed by designers who live and work in Tasmania using timber species unique to the island. Be prepared to drop some dosh! Block out a few hours for this one, there’s a lot to see and the museum and art gallery are at separate sites (walking between both is a breeze though, thanks to a riverside path). The museum is located in derelict railway workshops, but at its peak, it was one of the largest industrial sites in Australia. Take yourself on a guided tour through each exhibition – highlights include a hands-on science centre, a railway shed featuring old-school trains, a planetarium with screenings twice a day, a blacksmith’s shop with the biggest steam hammer in the southern hemisphere and the largest collection of convict-era material in the country. Head on over to the art gallery and you’ll find an expansive collection of colonial oil paintings, landscapes, portraits and furniture. There’s also an impressive assortment of Asian cultural artworks and a working Chinese temple. Harvest Launceston Farmers’ Market: Every Saturday from 9am to 1pm, you can buy the freshest produce – direct from farmers – right in the heart of the city. The Harvest Market’s philosophy to vendors is that if you pick it, bake it, grow it or brew it, you can sell it. Get in early and make a beeline for George Town Seafoods (their catch is from Bass Strait the day before), Honey Tasmania for the best baklava we’ve ever tasted and Southern Sky Dairy for the truffle cheese. But there’s so much more: fresh bread, preserves, amazing coffee, pâté, wine and game meats – it really is a must-see. Pack your appetite! Tasmanian Gourmet Sauce Company: With over 29 different sauces, mustards, relishes, chutneys and jams (all made from fresh Tassie produce), this small but well-stocked shop will turn you into a condiment connoisseur yet. We couldn’t go past the traditional chocolate sauce, but the chilli jam and honey mustard were also up there. Evandale Market: This is one market that has it all: fresh fruit and vegies, just-baked bread, delicious coffee, books, antiques and a wide selection of akubras. The market is open every Sunday from 8am until 1.30pm and entry is 20 cents for adults (kids are free). Hollybank Treetops Adventure: Just 15 minutes north of Launceston is Hollybank Forest, the backdrop for this exhilarating (and elevated) three-hour experience. In a nutshell, you’re strapped into a harness and led to a tree platform called a ‘cloud station’. Connected to each station are cables ranging from 45 to 370 metres in length, and once the safety checks are complete (you have two guides with you at all times), you’re told to sit back and enjoy the ride. Flying through the forest canopy and over rivers is, quite simply, sensational. The only downside? You can’t take your camera with you! Cameras in the trees capture the moment though, and you can purchase your pics at the end of the tour. Phew! The Basin Cafe: Floor-to-ceiling glass windows give you the best views of the Basin. Nosh on the creamy seafood chowder with scallops, prawns and Tasmanian deep sea fish. Stillwater: A flawless fine dining option. What was once an 1830s flourmill is now a modern Australian restaurant specialising in fresh regional produce. Think white tablecloths, candlelight and impeccable service. Order the degustation, you won’t look back. Mud Bar and Restaurant: A bustling bistro with hearty dishes like steaks, gnocchi, linguine and pan-roasted market fish. On a Friday night, the bar is packed with nine-to-fivers welcoming the weekend. Pierre’s: Tasmania’s oldest brasserie and home to Australia’s first espresso machine, Pierre’s is a Launceston institution. From the red velvet ceiling to the black and white tiles and the signed Gordon Ramsay chef’s coat in the restrooms, it’s apparent that owner Rohan Birchmore has an eye for detail. The coffee is ridiculously good, too. Josef Chromy: Tassie’s second largest winery has gorgeous gardens and breathtaking views. The wine’s not bad either! Grab a glass of the 2011 Pepik Pinot Noir and perch in front of the fireplace. Holm Oak Vineyards: Upon arrival you’ll be greeted by Pinot the pig, who sits on command when you feed him an apple (no, really – this actually happens). But the point of difference for this small boutique winery is Arneis – a wine made from an Italian grape native to the Piedmont Region. Holm Oak is the only winery in the state to grow this vine, so be sure to sample a glass. Or two. Goaty Hill Wines: This charming cellar door was established just six years ago and it’s a bit of a hidden gem, nestled amongst bushland. While they’re known for their Riesling, be one of the first to try their new premium sparkling, just released. Hint: Pre-order a delicious gourmet cheese and antipasto platter (made from local produce) to break up a tipsy tasting afternoon. Moores Hill Winery: This was Rod’s old vineyard, and he painstakingly planted every vine. Go for the Riesling (it has won a gold medal or prize every year since it was planted, most recently taking out the gold medal in the 2011 International Riesling Challenge). Trust me, it’s a winner (pardon the pun). Velo Wines: Opened in 2006, this cosy cellar door has recently undergone a reno thanks to a generous federal tourism grant. A new cafe has just opened serving up pulled meats like goat and suckling pig, smaller tapas-style dishes, wood fired pizzas, antipasto platters and pies. You’ll find a microbrewery on site if you fancy a pint, along with award-winning wines. Hot tip: Sip on the 2009 Shiraz, they’re one of only three Tassie vineyards to produce a cool-climate variety. Whether you want a campsite, a self-contained unit or a B&B, you’ll find it online at discovertasmania.com. Hatherley Birrell: This grand 1830s mansion has been converted into two opulent apartments with all the trimmings. The Ballroom on the top level (where we stayed) was spacious and regal with French doors, high ceilings, gilt mirrors and an imposing Italianate marble fireplace. There’s an eight-jet spa bath and continental breakfast provisions (including Toby’s Estate organic tea and coffee) in the fully-stocked kitchenette. At $280 a night it’s not cheap, but you’ll never want to leave. Quamby Estate: Describing here as grand wouldn’t do it justice. This 1830s homestead set on 100 acres of land features 10 suites with chandeliers, polished floorboards and high ceilings. Make a cuppa and relax on a chaise lounge in one of the sitting rooms – which all have working fireplaces. Hint: When booking, ask for room two – it’s the only superior room with a spa bath. Rates start from $95 per night for a standard room. Peppers Seaport Hotel: Positioned right on the marina, this 60-room hotel is modern and comfortable with fantastic views of the Tamar. The rooms feature a neutral colour palette and all the creature comforts (Wifi, DVD player, CD player). Pop downstairs to Mud Bar and Restaurant for dinner or venture into town – it’s just a five-minute walk. Rates start from $149 per room per night.